GRE has several Vector Network Analyzers with 2 coaxial access. For multi-port networks, measurements are possible, subject to connect other access to appropriate 50Ω loads. The group is able to measure complex permittivity using the HP 85070B kit. with a tolerance of + / -5% on the relative permittivity and + / -0.05 on the dielectric losses. 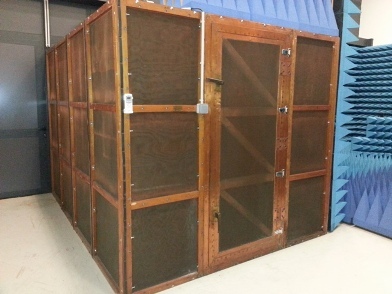 GRE has a Faraday cage (84 type from Ternois Industrial Society) with double-shielded copper wire. Its internal dimensions are 2m35 long by 3m10 height and 2m05 wide. 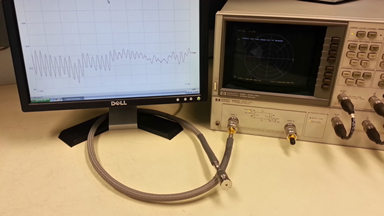 > 100dB from 350MHz to 1GHz. The group has a photoplotter for achieving etch mask with a minimum resolution of 25 microns. It is therefore possible to produce prototypes on substrate (preferably microwave qualified) with single or double copper face(s).